The storage system see below has been inspired by the honeycomb shapes / form, created by bees. Each storage unit is hexagonal in shape and has a similarly shaped drawer. This is an efficient and space saving shape / form, as all space is utilised. Also, individual units can be bought and a complete unit of any size can be built. The customer can mix and match colours according to his / her likes and dislikes. 1. What do you think of this design? I like the multi-coloured storage system, as it is very different compared to the traditional unit, normally found in furniture stores. The honeycomb design can be purchased unit by unit, which allows the customer to buy units as he / she can afford them. The system can be arranged to form a compact unit and conversely a loose system of separate units. This will suit a range of potential customers. The drawers could be taken out of the unit and moved to more suitable position for use. They are easy to access as the top is entirely open, although when pushed back in the unit, they are totally enclosed. 2. Describe how the design could be improved. You can include additional units. The system could be integrated with other pieces of furniture, such as a pair of easy chairs. They could be designed in the same hexagonal style with a ‘Memphis’ colour scheme. The chairs could be positioned, so that a seated person can still access some of the units. The central drawer fronts will not be coloured but mirrored, allowing them to used as a vanity mirror. They will also reflect light, helping to illuminate the room. Two storage units have been converted into separate LED clusters. These will provide atmospheric lighting for a room. 3. In the space below, sketch the improvements / additions you have described in the previous question. 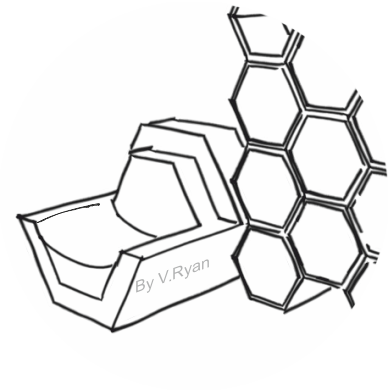 I have designed an hexagonal easy chair, that could be placed at either side of the storage unit system. It is in the same style of the units and it’s size emphasises the honeycomb shape and form. 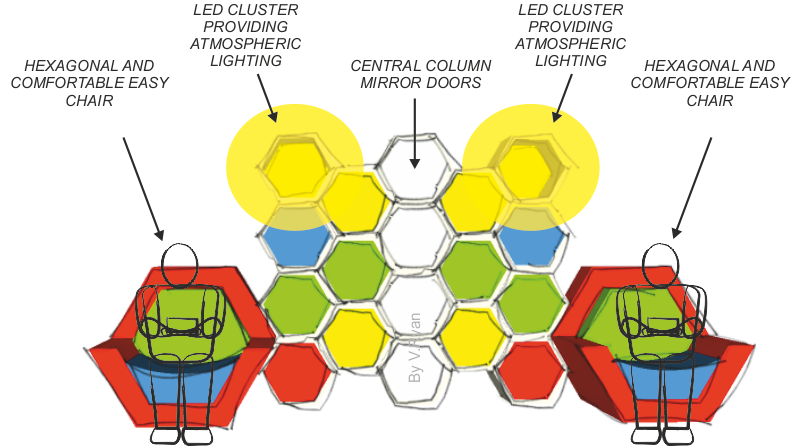 Two LED light clusters have been included on either side of the honeycomb system. The centre storage units have mirror doors, so that they can be used as a vanity mirror. The same ‘Memphis’ style colour scheme has been continued on the additional pieces.